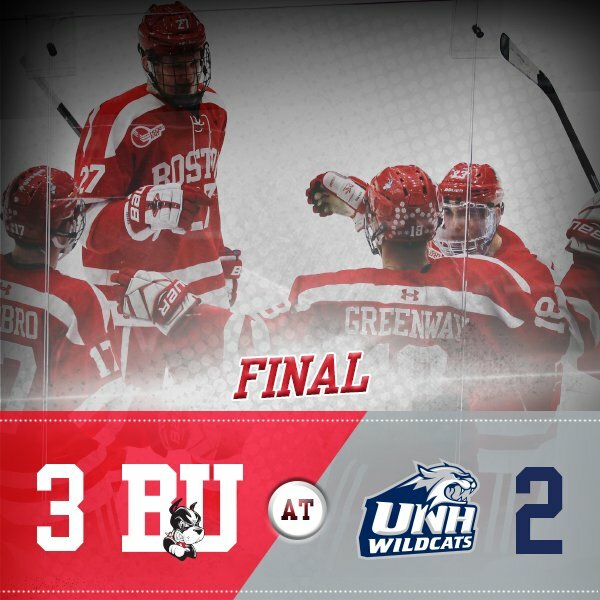 Second-period goals by freshman Ty Amonte and junior Jordan Greenway powered BU to a come-from-behind 3-2 win against New Hampshire at the Whittemore Center in Durham. 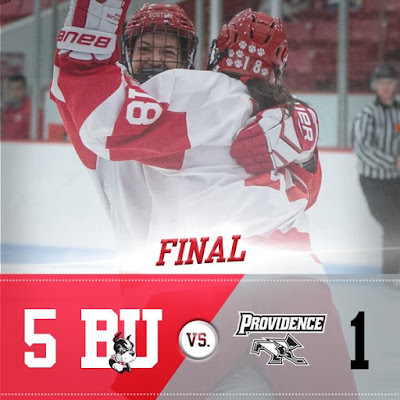 With the win, the Terriers evened their Hockey East record at 7-7-1. BU dominated the first period, outshooting its host 16-7. Early in the period, with the Terriers on a power play, Brady Tkachuk dropped a pass to Brandon Hickey for a slapshot from the left point. Wildcat goalie Adam Clark made the initial save but Shane Bowers slid the rebound home. BU appeared to double the lead at the nine minute mark but it was ruled that Bobo Carpenter kicked the puck into the net. Minutes later Jordan Greenway followed his own initial shot but again it was ruled the puck was kicked in. 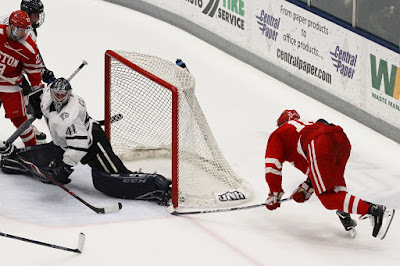 New Hampshire evened the score late in the first when Eric McAdams beat the Terrier defense to a carom off the end boards and squeaked the puck past Jake Oettinger to the glove side. Then in the opening minutes of the second Jason Salvaggio took a McAdams pass on a 2-on-1 and fired into a half-empty net. BU got the equalizer when Hank Crone controlled the puck behind the UNH cage and found Amonte at the bottom of the right circle for a one-timer past Clark, low to the stick side. Late in the period, Greenway gathered the rebound of Tkachuk’s shot behind the net and used his long reach for a wrap-around score that would be the game-winner. There was no scoring in the final period as Oettinger made three stops on a late power play to keep BU in front. He finished with 26 saves—20 in the final two periods. Terriers host Providence on Saturday with an early puck drop of 5 p.m.
2019 recruit Case McCarthy scored twice and Trevor Zegras assisted on a pair of goals as the NTDP U17s came from behind to defeat Central Illinois, 6-5. 2019 recruit Robert Mastrosimone scored a goal and an assist in USHL Chicago’s 6-5 overtime win against Cedar Rapids. A pair of goals by freshman Nara Elia led the Terriers to a 5-1 win against Providence at Walter Brown Arena. BU got on the board just 28 seconds into the first period on senior Victoria Bach’s 24th goal. Eight minutes later junior Reagan Rust, a transfer from R.I.T., doubled the lead. Elia scored both her goals in a 2:27 span early in the second—the first on a power play, the second at even strength—before the Friars’ Brooke Boquist put the visitors on the board. Freshman Jesse Compher’s empty-netter in the third closed the scoring. Sophomore blueliner Abbey Stanley had a career best three assists. Freshman goalie Corinne Schroeder made 29 saves en route to her eighth win.